For military members that are given the privilege of living off base, the military provides financial support to help secure housing. This assistance is known as the VA basic allowance for housing, abbreviated as BAH. The BAH is given to military members that are not being housed in government quarters so that they can provide housing for themselves and their families. The VA basic allowance for housing is a stipend that is provided based on a variety of factors that is based on the cost of living, dependants, and service member position. We Specialize in VA Home Loans, Get Pre Qualified Today – Click Here. One interesting aspect of the BAH is that it does not specify renting as a requirement. While it can be used for renting there’s nothing forcing it to be used on such. That means that a service member can actually use their BAH as income when applying for a mortgage. They can then use their BAH stipend to pay their mortgage! 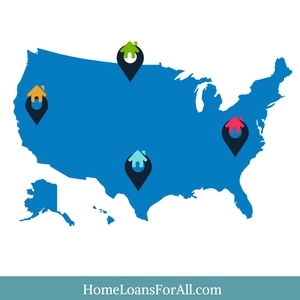 Depending on the location of the home and various other factors discussed below, it’s possible to have a mortgage entirely covered by BAH. While home ownership is not for every service member, for those interested in purchasing a home while on duty the BAH provides an incredible opportunity. BAH is available to service members assigned to permanent duty within the United States who are not living in government furnished housing. This includes active service members who are assigned to a base, but live off base in civilian housing. While not all service members will be given the opportunity to live off base, those that do will qualify for BAH benefits. For those stationed internationally, they receive similar benefits through the overseas housing allowance, or OHA, which is set up to provide similar benefits. 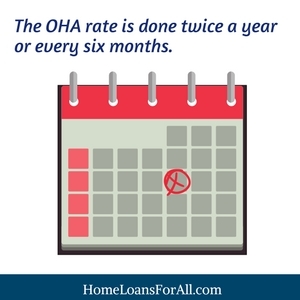 The OHA rate is calculated a bit differently, and is done twice a year or every six months. The rate itself is based on what members are actually paying, and not on averages like the BAH. For home buying, the BAH monthly stipend can be seen as purchasing power towards a home and go to paying the mortgage. Going to a lender, you can use all or some of your BAH earnings as income to increase your buying power and the loan amount you can aquire. A lender will want to verify the BAH amount, and will do so through your leave and earnings statement. The lender will also want to ensure that you will likely continue to receive the benefits. Lenders will be hesitant to work with someone who may lost their BAH benefits soon. Keep in mind, you don’t have to use up the entirety of you BAH. Any leftover can be applied to other things such as utilities or homeowners insurance. That’s assuming there is money leftover though. 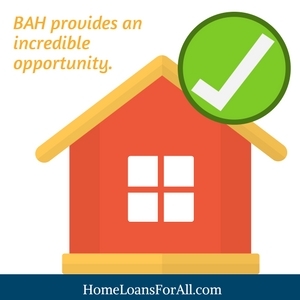 There’s no guarantee that BAH will cover your entire mortgage payment, and for more expensive homes payments will likely require additional out of pocket monies. It’s also very important to plan for changes in your service status and location. Many active duty service members relocate several times during their career. 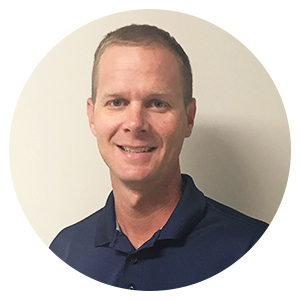 Not only will this change the amount received based on location and position, but there’s also the question of what to do with the purchased home. It some areas it may be easy to sell or rent the home, in some areas it might not be. Keep a backup plan in mind. Also, keep in mind that all of the other requirements for securing a mortgage are still in play. That means things like your credit score and debt to income ratio should still be in the acceptable range for the mortgage you’re looking to secure. There are a lot of different factors that go into determining the amount for BAH, so it’s hard to give a straight answer. The rate itself is calculated each year by the Department of Defense. They go through and look at aspects such as current rental costs, utility costs, and other factors like renters insurance costs. This rate is then further influenced by the individuals rank and pay grade, those higher in both are going to get a larger stipend for BAH. What this does is create variable rates that are heavily dependant on location. Service members in more expensive parts of the country generally receive a larger amount to stay competitive in the market. On the reverse, in cheaper markets they will receive less. It’s important to note that the given rate is based on the service member’s duty location, not the on the actual location of the residence. Lastly, having dependents also influences the amount for BAH. There is a separate with dependents rate that service members with spouses or children will receive. This helps to offset the additional cost for housing when living with others. Note that this is a flat increase based on having dependents, the number does not influence the rate. For example, a member with a spouse and no children and one with a spouse and children would receive the same amount. As BAH is recalculated each year it is subject to change based on the trends in the housing and rental market. That said, the DOD has created a rate lock which prevents your rate from going down. This is important in the eyes of the lender so that they can be assured a change in your rate in the next year won’t affect your ability to repay the loan. It’s also important to note that the rate lock assumes your rank, location, and dependant status does not change. If you’re re-located for example, you’re rate is subject to change based on your new location. The housing allowance through the BAH program is an extremely powerful benefit for active service members. The ability to use it as income when securing a loan can help many off-base living service members afford a home. Considering that BAH is additional on top of the standard salary, it’s easy to see how it can be extremely beneficial. Who Qualifies For Basic Housing Allowance in the Military? The BAH benefit is available for permanent duty military personnel in the United States who live in non-government funded housing. This is generally stationed military members who live in off base housing. Additionally, there is a similar, but different, program for service members stationed overseas called the Overseas Housing Allowance. What does basic housing allowance cover? BAH is meant to cover the majority of costs of housing including rent and utilities. That said, BAH money can be used for any sort of expense, and those that are able to use less than the amount they are given are able to save the rest. Is Basic Housing Allowance Taxable? No, BAH allowances are tax exempt stipends for service members. What Happens if the BAH Rate Goes Down? Due to the rate lock, if the BAH rate goes down you’ll maintain your old rate. However, your rate can go down in situations where you’re relocated to a lower cost of living area. How Is the BAH Rate Calculated? The BAH rate is calculated each year, and takes into account the cost of living in a particular area. It then is further influenced by the service member’s rank, pay grade, and whether they have any dependants. How Do Dependents Affect The Amount for BAH? Having dependants raises the amount of the BAH a member receives, but this is a flat rate for having dependents. The number of dependants does not matter.